"You have a football team here?" Dr. Gideon Ariel asks. "Ah. yes," he nods with a knowing smile. They need help. I can help then." 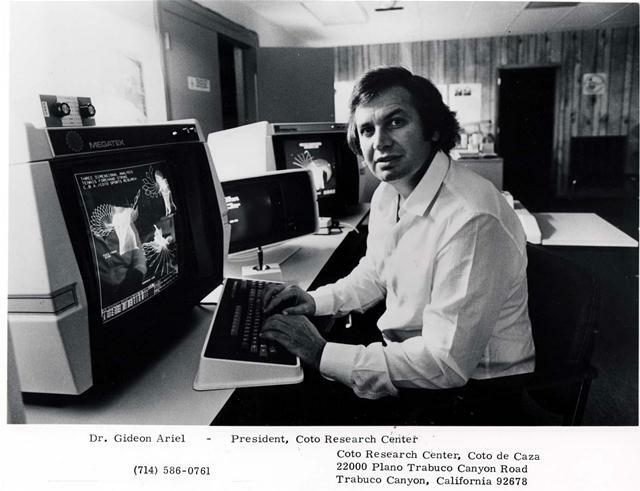 Gideon Ariel can help. He is already helping. As Director of Biomechanics for the U.S. Olympic Committee, he'll help prepare American athletes for their trip'toï¿½Moscow in 1980 and analyze performances there. Ariel doesn't look like a revolutionary, but in a sense that is what he is. At his Amherst. Mass., laboratory, he has wedded high speed photography with the computer and applied the scientific method to sports. What that marriage has done is to make three-dimensional analysis of body movement a relatively easy process. By showing the athlete the relationship between the attitude of his body parts and the speed with which he moves them. Ariel can show him how to change his technique and improve his performance. "It's basic high school physics," Ariel says. "It had been done before, but the only thing was, with so many calculations, it took months. Now, using computers, it takes days." Ariel is 16 years removed from his homeland. but he still speaks with a heavy Hebrew accent. Raised on a kibbutz in the town of Natanva. 20 miles north of Tel Aviv, he began putting the shot and throwing the discus when he was 17, and was a member of Israel's 1960 and 19;;4 Olympic teams. In 1963 he left Israel to attend the University of Wyoming on a track scholarship. 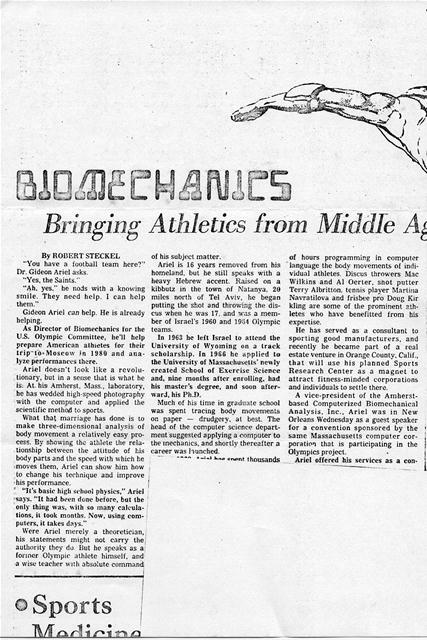 In 1966 he applied to the University of Massachusetts' newly created School of Exercise Science and, nine months after enrolling, had his master's degree, and soon afterward, his Ph.D.
Much of his time in gradu_ite school was spent tracing body movements on paper - drudgery, at best. The head of the computer science department suggested applying a computer to the mechanics, and shortly thereafter a career was bunched. of hours programming in computer language the body movements of individual athletes. Discus throwers Mac Wilkins and Al Oerter, snot putter Terry Albritton. tennis player 'artina Navratilova and frisbee pro Doug Kir kling are some of the prominent athletes who have benefitted from his expertise. He has served as a consultant to sporting good manufacturers, and recently he became part of a real estate venture in Orange County. Calif., that will use his planned Sports Research Center as a magnet to attract fitness-minded corporations and individuals to settle there. A vice-president of the Amherstbased Computerized Biomechanical Analysis, Inc., Ariel was in New Orleans Wednesday as a guest speaker for a convention sponsored by the same Massachusetts computer corporation that is participating in the Olympics project. "We are going to invite the individual governing bodies (each sport sponsored by USOC is managed by its own individual governing bod)) to Colorado Springs and say. 'Okay, here's the lab, here's what we can do with it. tool, Ariel isn't sure. But one thing is clear, he says, the computer does not take the place of the coach. "For the first time, we're giving the coach the tool to see what's right and what's wrong v ith his athlete's performance. For the first time, he has a valid way of determining that. "You still reed the 50 percent psychology. Ile (the coach) is the psychologist, and the computer is his tool." To his research. this thing he calls his hobby - "That's our life: that's all we are doing ... Work is our happiness." - and the telling of it, Ariel brings considerable enthusiasm. devoted to speaking engagements. he is constantly in the laboratory. Each day's work fills him with the excite-, ment of the hunt. "To take somebody who isn't a champion and make him a champion - that is our contribution,." he says. Ile pointedly distinguishes between his methods and those used b_v Soviet bloc countries." We don't touch the athletes, we don't draw blood, use don't take tissue samples. "The approach is biomechanical. By using film analysis with the computer, we simulate ideal conditions and quanti#v potentials." His work has cast him in the role -of prophet and, not surprisingiv, he expresses impatience with what he considers to be the backwardness of American coaching and athletic- training techniques. "We are in the Middle Ages," he says. "No other industry would take. five experts, tell them to look at an individa,31's performance, and then have ti' m give five different opinions of s bat happened. 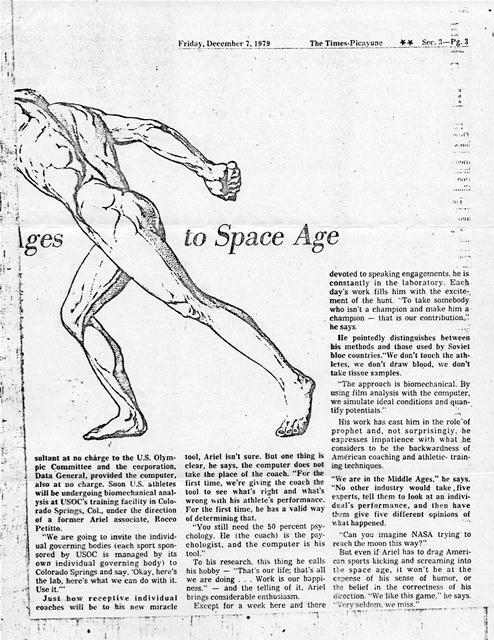 "Can you imagine NASA trying' to reach the moon this way?" But even if Ariel has to drag Americ:,n sports kicking and screaming into t`e space age, it won't he at the c-ense of his sense of humor, or 0--2 belief in the correctness of his di: ection. "We like this game." he says. -rv seldom. v; e miss." Generated on 4/20/2019 12:06:43 PM (PST) ADI/HQ/GBA/2019/ARIELCLOUD/v3.0.2018.0126.